ANN Service, SIVASAGAR, April 23 - The fifth triennial Assam Gorkha Sanmilan concluded today at Sivasagar Natya Mandir with Ram Prasad Sarma, MP, Tezpur Parliamentary Constituency and Kamakhya Prasad Tasa, MP, Jorhat Parliamentary Constituency addressing the open session held. MP Sarmah, addressing the gathering said that Gorkhas are very much an indigenous group, part and parcel of Assamese society and every Gorkha is prepared to make even the supreme sacrifice for the honour and integrity of Assam. 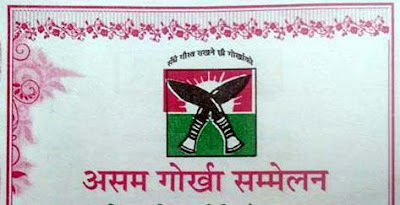 MP Kamakhya Prasad Tasa urged all not to assert one’s own identity but to assimilate with greater Assamese and greater Indian nationalism so that the BJP motto of ‘Sab ka saath sab ka bikash’ becomes a reality. He said that the poor ones, whether they belong to Gorkha, tea tribe, Ahom or any other tribe should never get sidelined in our march towards development. Tasa also released the souvenir ‘Rongpure Gurkha’, edited by Sivlal Badala. The meeting presided over by Bhakta Bahadur Newar, president, Sivasagar district unit, Asam Gorkha Sanmilan was addressed among others by Karna Bhujel, Pankaj Chetri, Krishna Bhujel, Mridusmita Sinha, chairman, Sivasagar Municipality Board. A new committees of Asam Gorkha Sanmilan was formed in the meeting with Pradip Lama as president and Lakhi Chetri as secretary (Sivasagar district) and Bhim Chetri as president and Ganesh Lama, secretary (Charaideo district). Earlier on April 22, Pradip Lama inaugurated the delegates camp at Sivasagar Milon Mandir while CB Rai inaugurated the delegates meet. The fifth triennial Assam Gorkha Sanmilan concluded today at Sivasagar Natya Mandir with Ram Prasad Sarma, MP, Tezpur Parliamentary Constituency and Kamakhya Prasad Tasa, MP, Jorhat Parliamentary Constituency addressing the open session held.